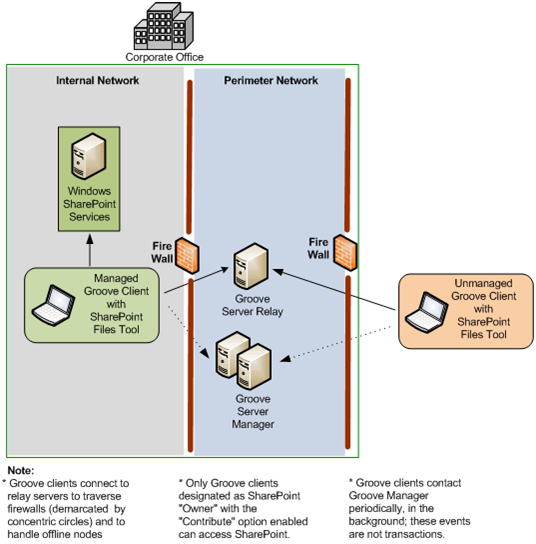 Microsoft Office Groove is a bit of a mis-understood creature, as a group-ware/off-line client tool – with a sharing ability for documents and images. The difference is that there is no “server” as such – well, there is but works as a peer-to-peer program in reality. That can be good – and bad – if a PC isn’t “sync’ed” up, then other folk won’t get the changes. When used as a document collaboration tool, it’s rather lacking – with not much in the way of metadata, workflow, etc. Groove is to SharePoint the same as Outlook is to Exchange. That’s a great analogy – working as an offline client to a server-based repository. You then get the “smarts” and function of SharePoint – without having to save files to your local C: and/or problems working offline. All I can say is… Groovy, baby yeah !